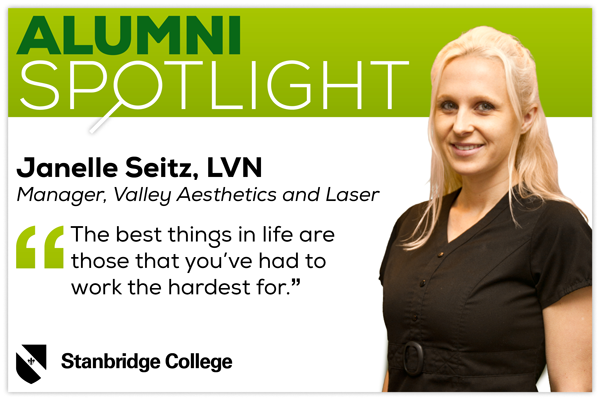 Stanbridge College spotlights alumnus, Janelle Seitz, Licensed Vocational Nurse and Manager of Valley Aesthetics and Laser in Huntington Beach. In her interview, Janelle talks about her inspiration for becoming a nurse, her life as a student at Stanbridge College, how she passed the NCLEX, and how making a difference in the lives of her patients gives her a sense of self achievement each day. SC: Tell me about your new position managing Valley Aesthetics & Laser. What do you do? JS: I currently manage the Valley Aesthetics and Laser in Huntington Beach which includes conducting consultations, assisting in procedures, performing procedures, staff scheduling, marketing, sales, and customer service. SC: What was your inspiration for becoming a nurse? Why did you choose this profession? JS: Before nursing school I was managing payroll for over 400 people, over those 4 years not once did I ever go home with a great sense of self achievement. I chose the nursing profession because I really wanted to make a difference in people’s lives. SC: Why did you choose Stanbridge College for your Diploma in Vocational Nursing? JS: Stanbridge was recommended to me by a friend who was in the program. After visiting the campus, I knew it was the right place for me. SC: What was your overall experience like at Stanbridge? What was the biggest lesson you learned? JS: Stanbridge was great. I learned a lot in theory and we visited many clinical sites that I was able to see a variety of settings and procedures. The biggest lesson I learned was to listen to my instructors, this came true when it came time to take my NCLEX. Because of nursing school I have become more sensitive to people and the realization that everyone is going through their own battle. JS: I spent most of my time preparing with ATI tests and I purchased a few review books. I was confident in what I was taught during school and didn’t want to go on information overload, so I put aside an hour a day for 2 weeks prior to my boards exam and I passed first round. JS: My primary focus right now is growing my office and making people feel better and more confident about themselves. I have patients that have lost over 20 pounds with our weight loss program, patients that now feel confident wearing a tank top after completing laser hair removal and patients now confident in wearing a 2 piece bathing suit after completing SmartLipo Laser Liposuction. I’m doing what I’ve always wanted to do. SC: What advice do you want to give future nursing students? JS: The best things in life are those that you’ve had to work the hardest for. Stay focused and don’t give up. SC: What is the biggest strategy you can share with fellow students that led to you securing your current job? JS: Commit yourself 100% and the rest will fall into place. I landed my current job from a past patient of mine who referred me because I always provided her with great service.